1. 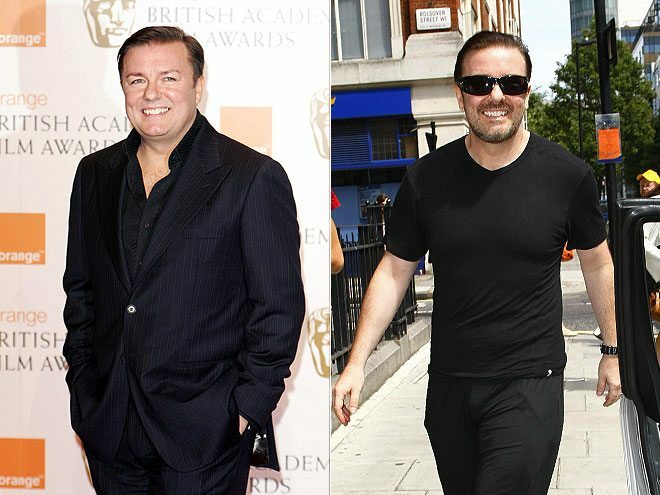 Ricky Gervais – British funnyman Ricky Gervais wasn’t laughing when he realized he was overweight. After a lifetime of being thin, at 30, years of laziness and physical inactivity caught up with the The Invention of Lying star. Afraid that his lifestyle would kill him, he and his partner Jane Fallon chose to get in shape together. The Office creator and comedian lost over 1 ½ stone by running, doing 35-40 minutes of cardio, and weight-lifting for 20 minutes daily. He claims he hasn’t changed his eating habits much, but has simply gotten healthier by becoming more physically active. My name is Nick and I love sports. I went to school for sports writing and I have loved sports for as long as I can remember. I've always loved competition. There is no more pure way to measure the meddle of skilled competitors than on the playing field of the sports at which they love most. From NCAA football to the NFL Pro Bowl, I love football! But that's not where my love for sports ends. I competed for my schools Lacrosse team during my time in college and even spent some time coaching during the time spent attaining my masters in sports journalism. If you have a passion for sports like I do - you're in the right place!